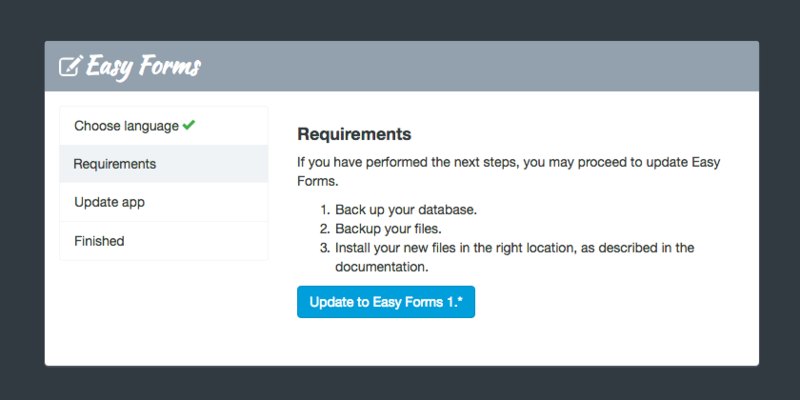 This document describes how to upgrade your Easy Forms application from 1.x to 1.6.8. Note any error messages you see (take a screenshot or copy your logs). Restore your site to its previous state, using the file and database backups you created before you started the upgrade process. Do not attempt to do further updates on a site that had upgrade problems. Contact us via our support page on CodeCanyon. Note: All directories mentioned in this document are relative to your Easy Forms installation directory. Make a full backup of files, directories, and your database before starting, and save it outside your Easy Forms installation directory. config/db.php: Stores the database configuration. static_files/uploads: Stores files uploaded by your users when they submit their forms. static_files/images/avatars: Stores your registered users' avatars. Any custom directories and files you added elsewhere. If you made modifications to files like .htaccess or robots.txt or config/params.php, you will need to re-apply them from your backup, after the new files are in place. Re-apply any modifications to files such as .htaccess or robots.txt or config/params.php. Open config/web.php with a text editor. Run to the update script. Once the update is done, this line must be commented again. Try to run to the update script again and make sure that the ‘Page not found’ message is displayed. Special Step: To update previous forms to v1.6.6 go to Site Settings -> Performance -> Update Form Builder fields -> Click Update. And that’s it! The upgrade is now complete. Your upgraded Easy Forms application is now ready to use. Enjoy! Note: It is always recommended try an upgrade on a test copy of your site before applying it to your live site. Even minor updates can cause your site's behavior change.